Wow that really sounds like you're going to give this dog a lot of thought and effort, good for you! There are obviously many many breeds out there, and i am slightly biased, but as somebody who has owned a really mixed bag of dogs over the years, i wouldn't say that a cocker spaniel is far off the mark. Whilst they do need and love plenty of exercise, it sounds like thats exactly what your going to give them, so i can't see what the breeder was saying??? I just find that spaniels are all round great dogs, wonderfully happy, loads of love and just the most amazing personalities, and obviously they're not big dogs. Im sorry thats a biased view lol but something tells me you may be getting a few round here (we can't help it) Would be really great to hear what you decide in the summer. And welcome to the forum! wow, thanks alot! i think the breeders opinion was based on the idea that perhaps chocolate cockers are too energetic, or are too difficult to train..i really don't know about that one. a cocker spaniel is probably the leading contender for me-that and a beagle-whom i know are notorious for being difficult to train-and if i was allowed a bigger dog, i would love a german sheperd or maybe a labrador. my mum's friends got a black cocker, and she says she had no problems training him-she's even pondering getting another! and as for it being too energetic, that characteristic would be the mirror image of me, as i play for a football team, and play tennis competitively. Last edited by Bigboy; 04-27-2009 at 03:27 PM..
A spaniel does sound right for you. You could maybe do some field training too. Have you considered a rescue dog? There are many spaniels in rescue. 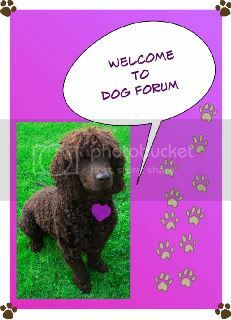 My own Irish Water Spaniel came from dogs trust. He was only 14 months old - still a puppy really! If you are energetic I think any dog would suit you That's one of the main reasons dogs are given up - because the owners cannot give them enough exercise, they become boisterous and unruly = badly behaved. Not the dog's fault. So good luck! You are doing the right thing researching dog ownership. If there's anything you need to know there will be someone here who can help you. Hi jackthe jambo and welcome to the forum. That is great that you are thinking about this ahead of time. How much time are you willing to put into grooming - do you want to brush the mats out of a long haired dog's fur or would you rather have a short haired dog? How much energy should your dog have? Do you want a dog that will be tryng to get you outside to play with a ball or frisbee non-stop, or would you rather have a dog who is content to snooze by the couch? These are just examples, the idea is it can really help to get a dog that fits in with your likes and dislikes. hi "bigboy", and thanks for your reply! money wise, i am enquiring about local jobs, to pay for the dog walker ( which i will hire to walk him/her for an hr whilst i am school ) and my mum will pay for running supplies that will be constantly needed. as for training, i will have 7/8 weeks summer holidays, that i can give the puppy 24/7 attention to, and once i decide on what breed, i will look into possibe classes that myself and the puppy can attend, so that we can recieve as much help and advice as possible. hi, thanks alot for your reply! Good for you doing all this research, you'll make a fabulous dog owner. Speaking of someone who has a spaniel and has had them previously too, I can highly recommend one as a pet. In all seriousness a cocker could be fine for you, I would say not a working cocker but the pet/show type are slightly less mad. My cocker was from a shelter, she's a puppy farm rescue and is a wonderful dog. She's a bit hyper at times but if she gets her exercise she happily settles in the house on her own. The key is routine, once a dog settles they are fine - especially if they get all the exercise you say you're able to give. Things to consider with a cocker - they need frequent grooming or they tangle up very easily. They also need to be clipped in the summer as they don't shed like other dogs do, so this either means you have to pay a groomer or you can buy some clippers and do it yourself. They can be quite vocal, my cocker really loves the sound of her own voice. They're little dogs with a BIG attitude, moreso than other spaniel breeds. A cocker is the lord/lady of the manor and don't you forget it, this means they need to know their place from the start - if you let a cocker get away with too much they can become a problem. However, this big personality makes for a brilliant pet, they're highly trainable, very intelligent and have such funny characters. Also any training will only work with 2 main keys! 1. Repetition 2. Consistancy these are the main things for success in any training and of course plenty of praise and treats along the way! !